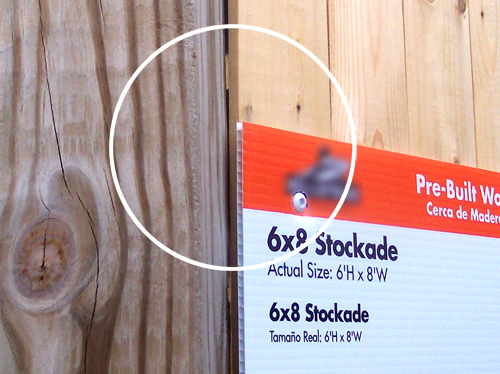 If you are considering purchasing your fencing from a “Big Box” Store, you need to look closely before you buy. Here’s what they don’t tell you. To find out more about why our products are superior to the “Big Box guys”, Give us a call. We will be happy to explain the differences. Wanna know something very cool about the wood fences we sell? Most of ours are made from Northern White Cedar-which is grown, harvested and milled locally! We like to support local folks whenever we can. Cedar is naturally resistant to decay and insects, so it will last for years. 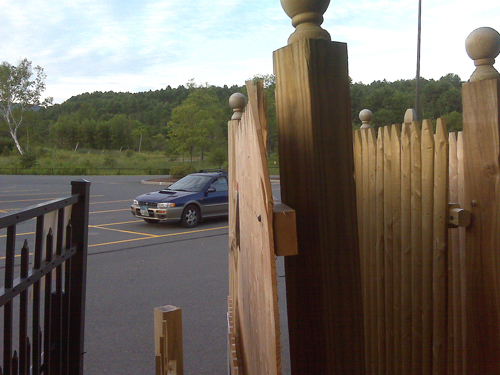 It is not uncommon for cedar fences to last for 15 to 20 years. We know of one cedar post & rail fence in Montpelier that has been around for 50 years. BEWARE! 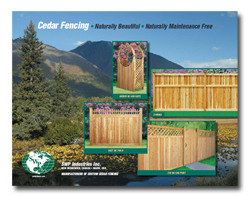 Some of our competitors sell fencing made from pine or fir. 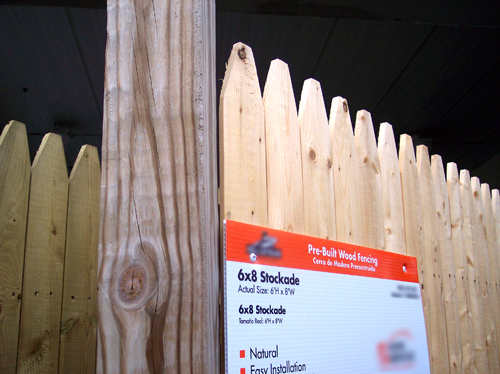 Without constant painting or staining however, you’ll be lucky to get 5 years out of your fence. If you are on a really tight budget, or if you are fixing up a house to sell, this can work for you. If however, you are looking for something that adds lasting value with minimal maintenance, look for fencing that is made from 100% cedar. Choose a category below to see a photo gallery for each type of wood fence that we sell, including picket fences, privacy fences, and other types of wood fencing. We also install Split Rail Fencing which has earned its own page. Is BUYING LOCALLY important to you? All of our panels are made by local mills–using cedar grown and harvested in Vermont and NH and employing local workers. Do you know where the “Big Box Guys” get their stuff? We get ours from a mill right next door – NOT FROM OVERSEAS! 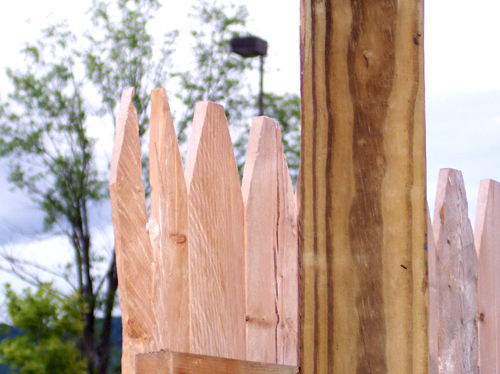 Many “Big Box” fence panels are made from untreated Pine, Fir or Spruce. While these species might be OK for interior use, fences are exposed to weather and insects! These materials are much cheaper and we don’t use them. We use only 100% cedar which reduces decay and insects, and can last 15-25 years. Pine, Fir and Spruce? You will likely get 3 to 7 years, depending upon installation area – unless you are willing to paint or stain them – OFTEN! Watch out! If the ads say “cedar”, they might be talking about just the pickets. 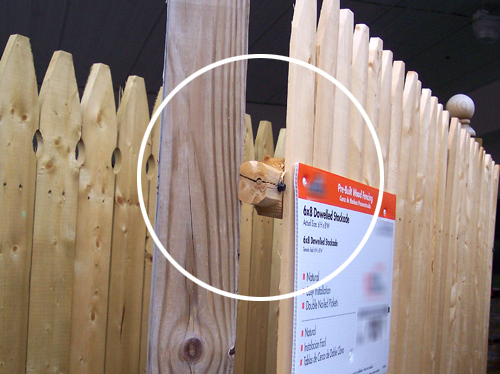 Backrails (which form the backbone of any fence panel) may be Pine, Fir or Spruce! Look closely – or ask! Many “Big Box” panels use MUCH THINNER COMPONENTS! See photos above! Thinner wood components will decay more quickly and are not as strong. Take a look how their panels are nailed together. If they do not use ALUMINUM “RING SHANK” nails, they may not hold in high wind, and you may get rusty drip marks when they get wet. 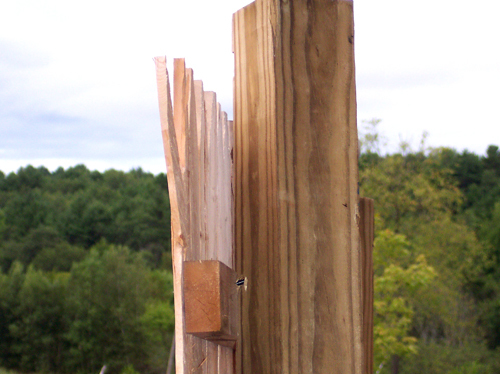 We use only aluminum ring shank nails – which are twisted into the wood and will never rust corrode or stain! We’d just like you to know the difference before you buy.